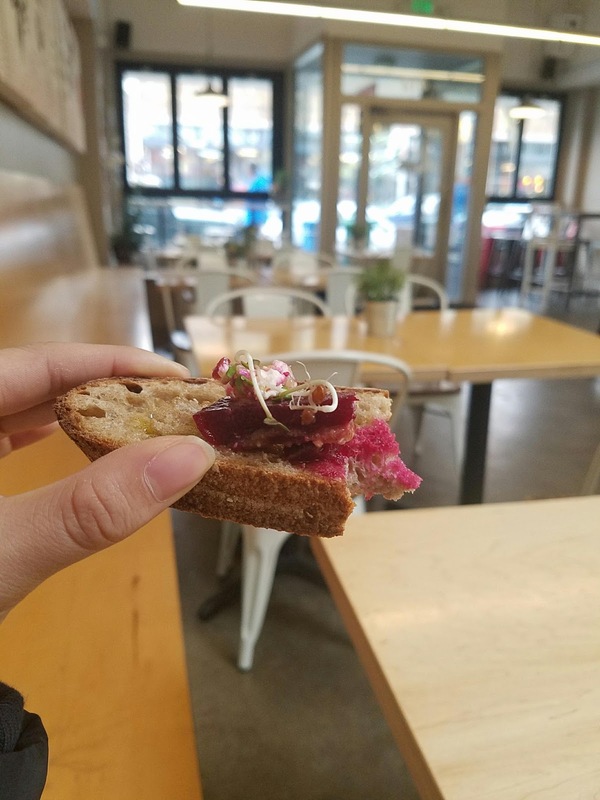 I had the wonderful opportunity to attend a tasting at one of Seattle's newer restaurants in Broadway called Dueminuti towards the end of last year. 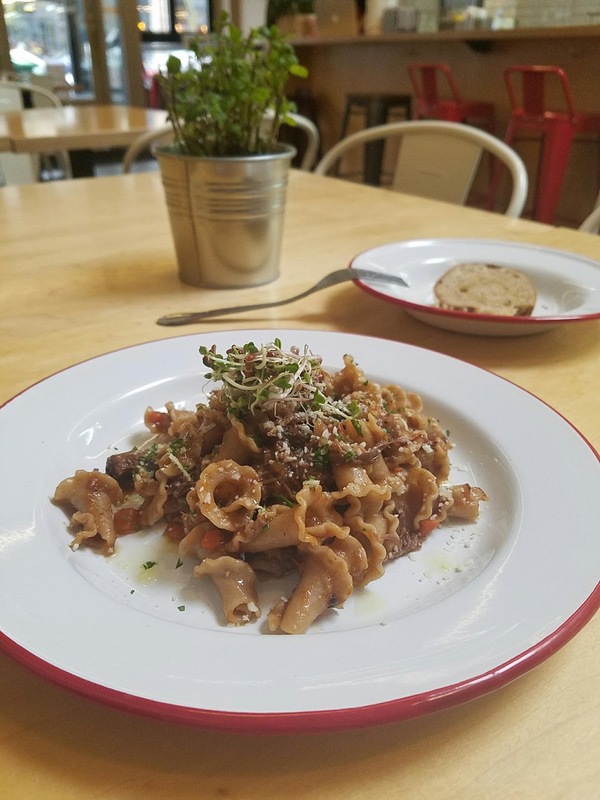 I was intrigued by the background of the two owners and their passion behind healthy gourmet pasta (which you can read more about HERE and HERE). 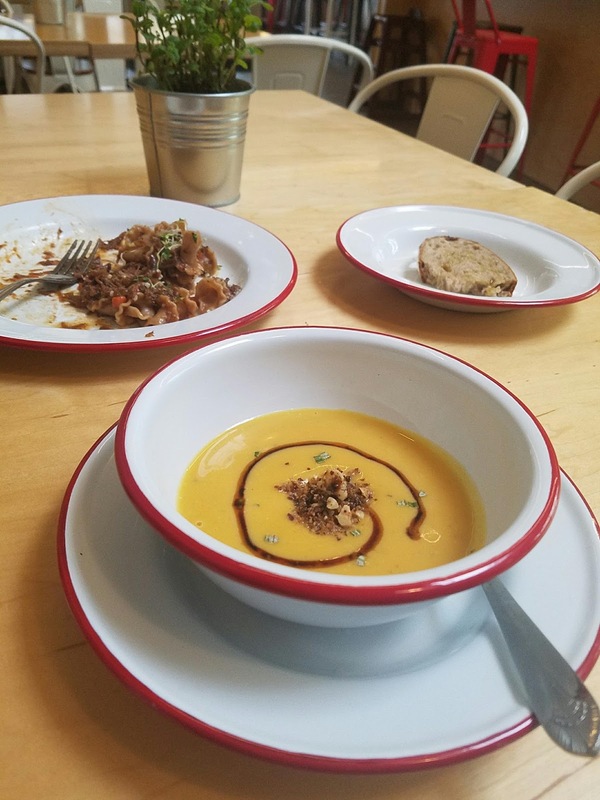 Today, I am sharing that experience and reviewing the dishes I had the luxury of tasting! 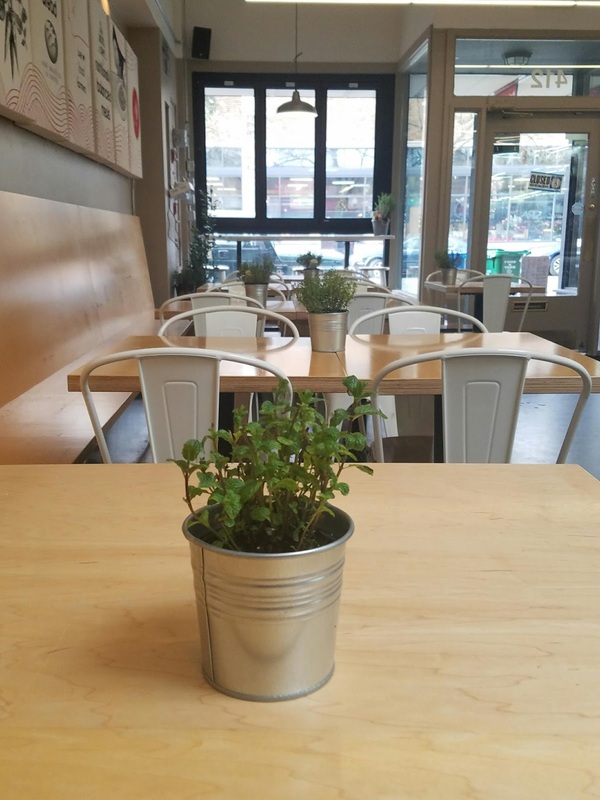 The interior is open and bright and the open kitchen and indoor garden for fresh herbs (which they use in their dishes!) and such was a treat to see. 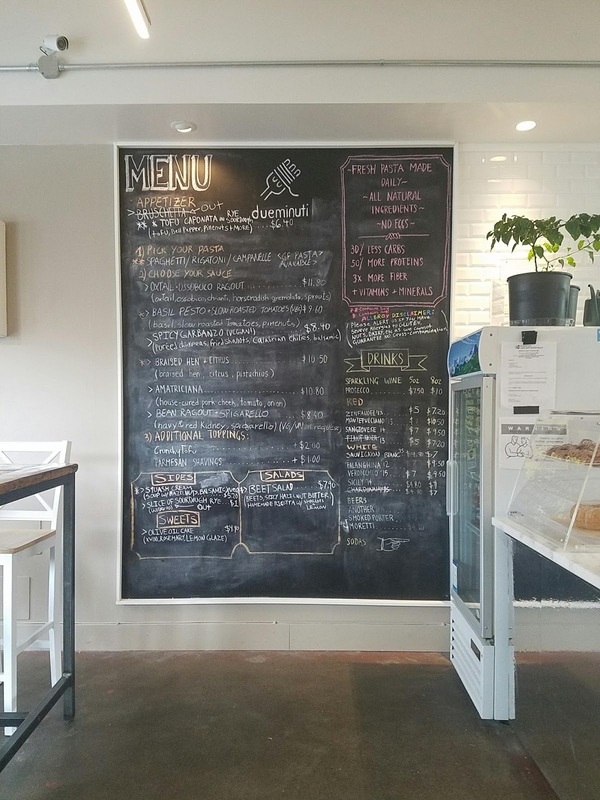 There's a giant handwritten menu you can't miss when you walk into your left that has an array of dishes for you to choose from. 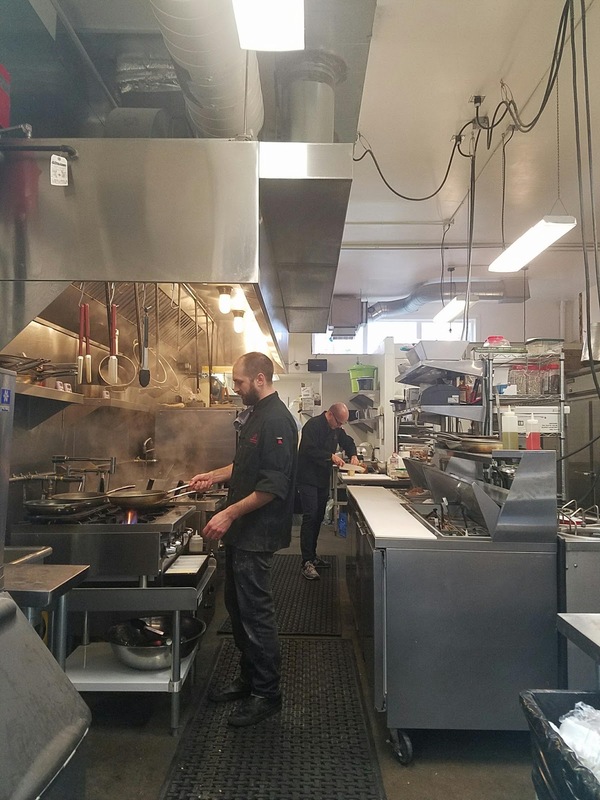 I was greeted by Chef /CEO and Co-Founder, Filippo and he took the time to break down their concept and their current menu at the time. I was in great hands as I asked the chef to just pick what he wanted me to try; I trusted his judgement! 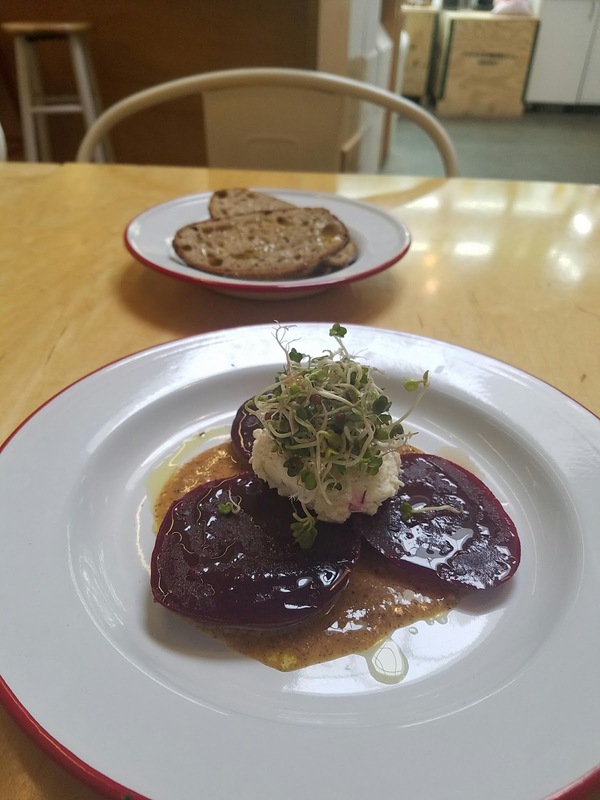 Pickled Beet Salad - I started off with fresh bread baked that they make themselves and a beet pickled beet salad. Everything was so fresh and delicious. 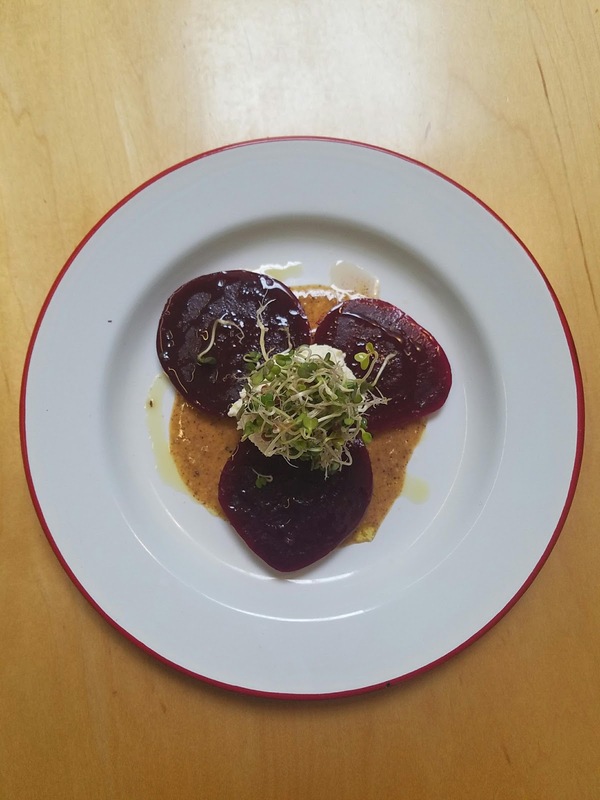 The beets had a nice rich color and sweet flavor and paired wonderfully with sprouts, lemon ricotta, and hazelnut butter underneath. Eaten together with the fresh bread made for a heartier start to the tasting. 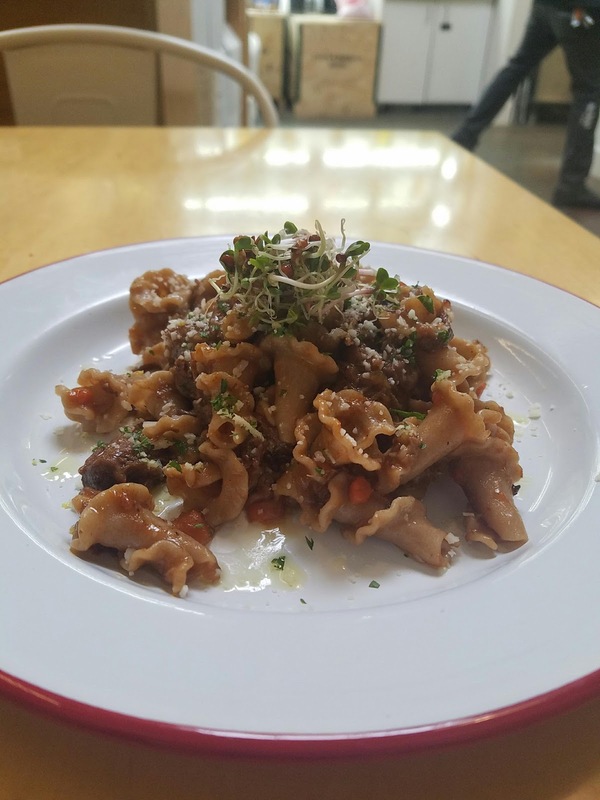 Oxtail Ragout -The pasta itself had great flavor and texture and same with the meat, however it was a bit on the salty side. 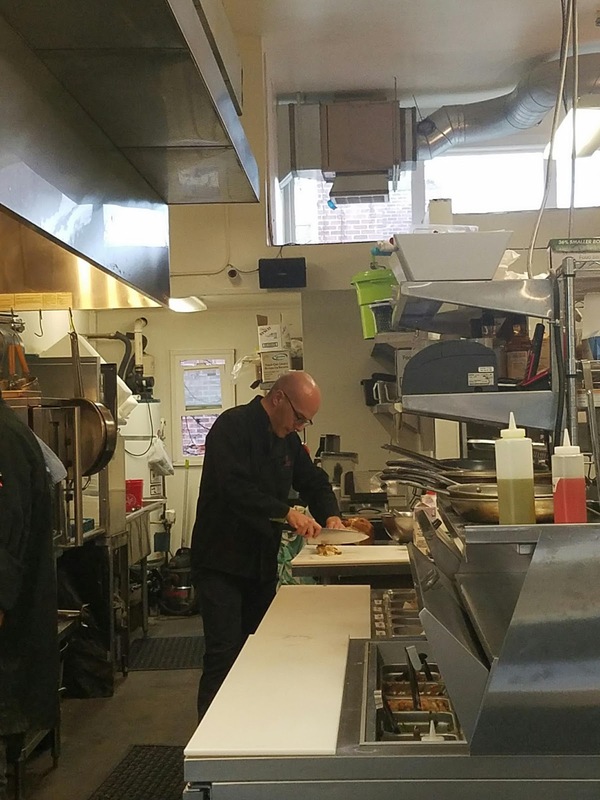 I appreciated the chef asking me about my thoughts and opinions as he took my notes to heart. 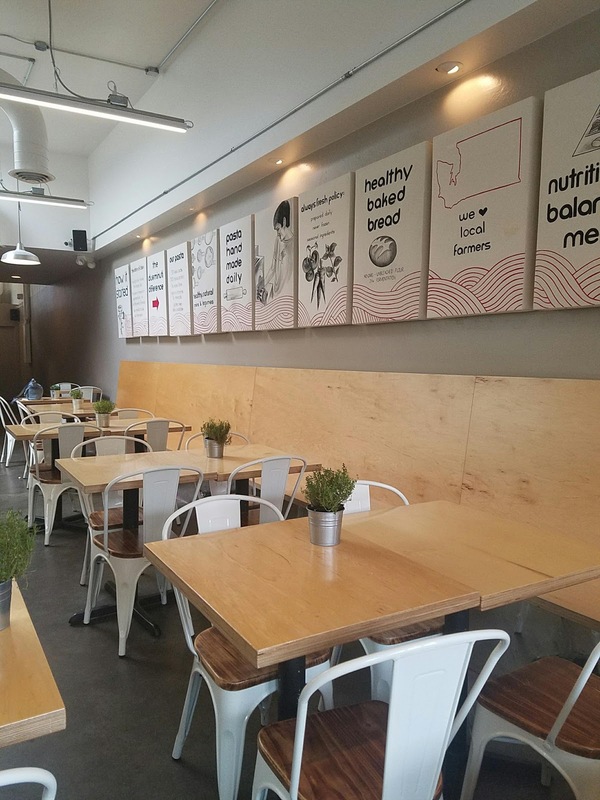 Being a new restaurant, they have to experiment with different palettes and finding the perfect balance to appease everyone. Delicatta Squash Soup - Thick, warm, and hearty with a nice amount of sweetness. The swirl of balsamic (I believe) added a nice added layer of flavor to the soup and the hazelnut added a tasty nutty crunch that paired well with the earthy notes of the soup. 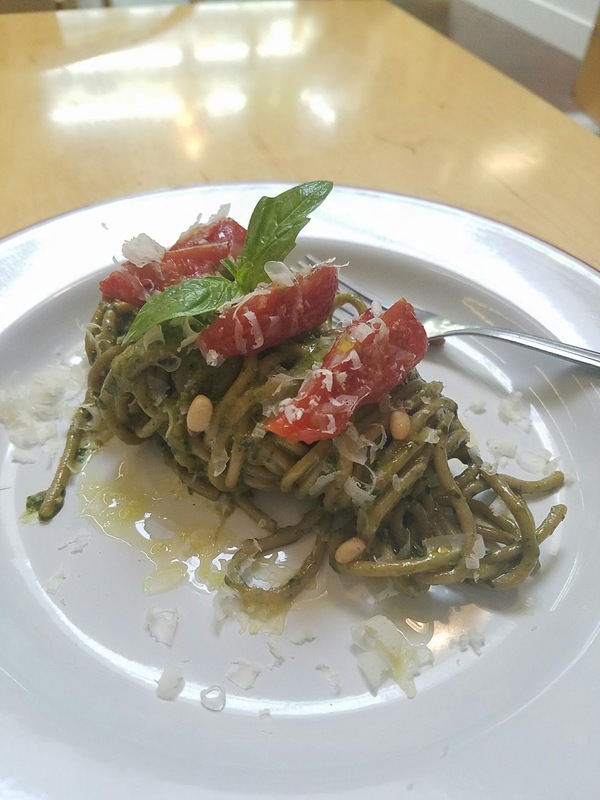 Pesto Spaghetti - If I wasn't already incredibly full, I would have enjoyed this dish even more as the flavor of the herbs in the pesto was nice and fragrant and the pine nuts were perfectly toasted. The tomatoes on top (roasted?) were sweet and juicy. The pasta was a bit too firm to my liking but this was still overall, a great dish. Olive Oil Cake - I've never had olive oil cake before but I really enjoyed this cake! It was mild in flavor and not overly sweet with a denser cake itself but was very tasty. 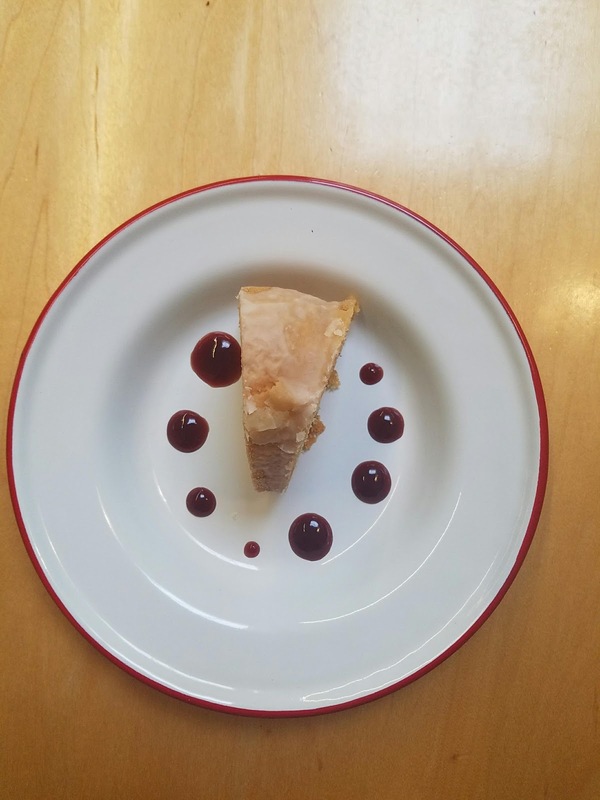 I thought it would be dry from the look of it but it surprisingly wasn't; the light sugar coating and berry glaze helped to enhance the flavor of the cake. I also had a chance to meet the other Co-Founder, Davide, and had a chance to learn even more about the duo. 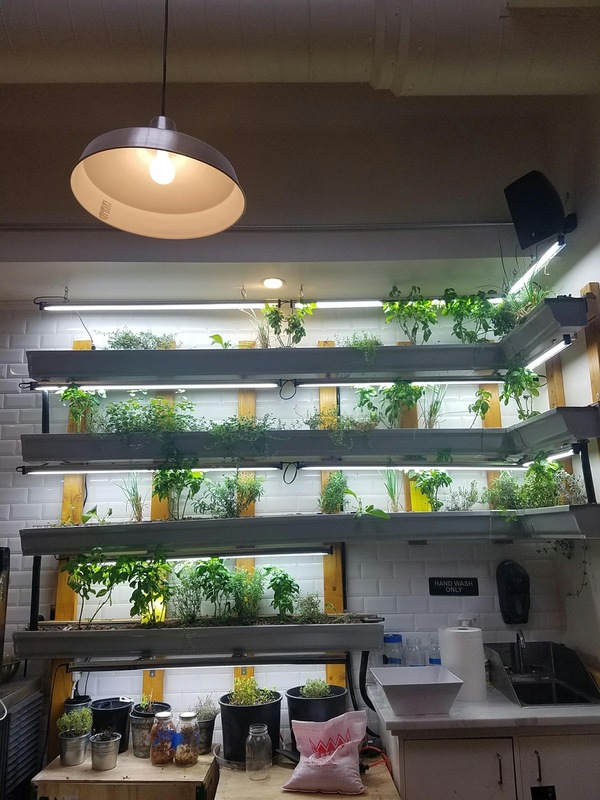 You can tell they are really passionate about what they are doing and it shows in their space and food. 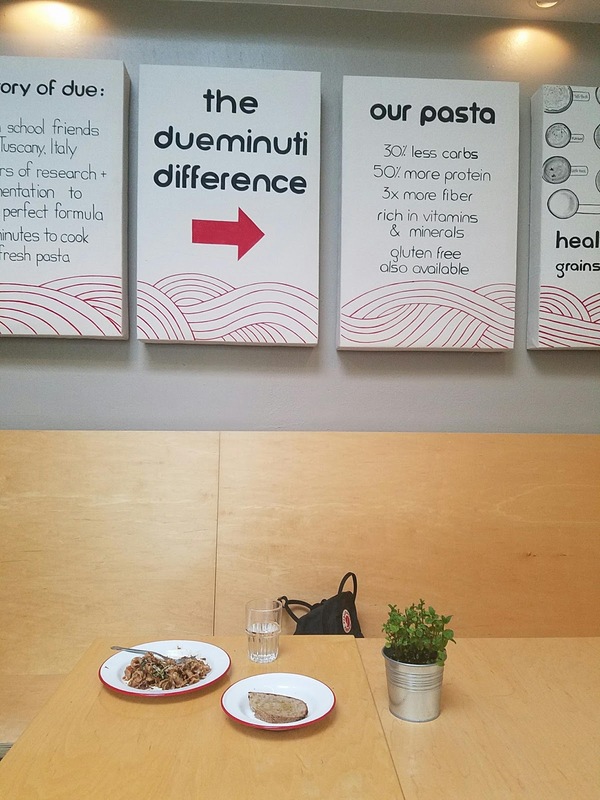 If you're looking for some delicious pasta that is both gourmet and healthy, then stop by the Broadway area and stop into Dueminuti!